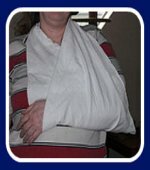 After bandaging an injured forearm or wrist the arm may require an arm sling. Use a triangular bandage. Open it up and place it lengthwise against the person's body. Make sure the point of the bandage is towards the person’s elbow on the injured side. Arrange the person's arm so that it is held in front of their body and bent at the elbow, with the forearm slightly up above the horizontal. Tie the hanging end of the bandage to the top end by looping it behind the person's neck. Make the knot on their uninjured side. 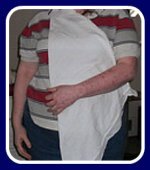 The injured arm should be comfortably supported in the sling. Fold the point of the bandage along the person's arm, and pin or tape it with say micropore/paper tape securely. This will prevent their arm from slipping out the back/elbow side of the sling. For more information on Fractures and Splints go to our fractures page.